RTV is pleased to announce Fusion’s powerful Single Property Website engine, built right into Fusion. With just a few clicks, you’ll have a fully functioning single property website, complete with an interactive virtual tour, traffic report, printable flyer, HD images, amenities, area information, agent and broker contact info, and — most importantly — the essential listing data. Creating a single property website has never been easier. Simply create your RTV account, choose your theme, upload your images, pick a domain name, and you’re done! With RTV’s new Fusion system, you can simply check availability of a domain name and purchase it for a small one-time fee of $12.99—no ongoing monthly charges! Small One-Time Fee of $12.99 Per Domain! Your polished and professional single property website will be up and running in less than five minutes. Already a Fusion user? Immediately start ordering single property websites simply by logging in, locating the property, and clicking the Single Property Website button. Put our technology to work for you! Let RTV handle the entire process, from domain registration to forwarding, masking, and site creation. Your Fusion virtual tour system will remind you in a year 30 days prior to domain expiration, so you can renew as needed. RTV’s Fusion is the only virtual tour software on the market that offers so many different functions and solutions at such an affordable price. Not on Fusion? What are you waiting for? Get your trial account up and running today and enjoy the very best virtual tour software on the market! 360 Image Media, producer of Milwaukee virtual tours is again changing the way Wisconsin Realtors and Home Owners can successfully sell homes, with our latest new product offerings. First is our new and improved Lake Geneva Single Property Website, now offering a basic and enhanced option. Our basic site includes a unique url and seo optimization. Our enhanced offers a full page with unique url, downloadable flyer and seo optimization. Both these options will help us provide the best Wisconsin Virtual Tours to all our clients. Our second new offering is geared to help out Wisconsin homeowners who are looking to sell their homes themselves. For these consumers 360 Image Media has launched a new For Sale By Owner page and package, at Wisconsin For Sale By Owner. This new package for homeowners gives them a outstanding virtual tour and property marketing that will get their property seen by buyers and compete with the agents listings. Once again the 360 Image Media team and our partner RTV have created additional and improved ways to stay on the cutting edge of the virtual tour industry. I wanted to share with you all a little something that Virtual Vista has been offering to its clients. Virtual Vista has taken the Single Property Website to the next level! We have created a template that uses the embedded virtual tour and the specs that normally appear on the side of the tour window. Also, we have added a link to Realtor.com for more detailed information. We have also added a slideshow, along with the RTV mortgage calculator, school information, and a Google map. Another cool feature we have added is the request for information form, which is then forwarded to the agent’s e-mail. We have also created a page that allows the client to view the traffic to the property’s site. 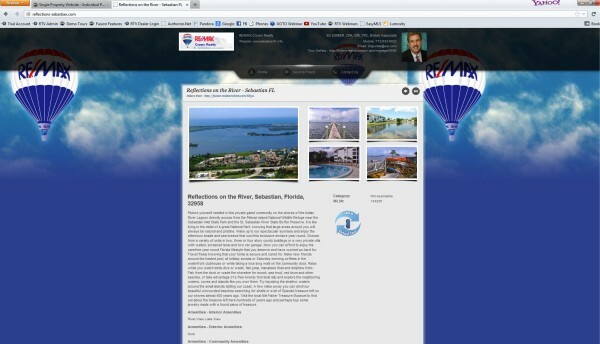 Each site can be customized with the company logo, agent picture, and the color scheme of choice. Our property websites look great; they are simple and user friendly, and extremely functional. We also offer a standard and premium panoramic sign rider. Please, check out our Property Website Packages. We are very excited about this, and would love to know what you think!!! Please send us some FEEDBACK. Another quick thing we had to create is a YouTube Tour due to demand in our area. Look at ours, then check out what Circlepix offers. Circlepix who? Yeah that’s what we said!!! The virtual tour industry becomes more competitive every year. More companies that offer “virtual tours” (even if they are just simple slide shows) open their doors every day. That means more companies are fighting for the same customers. So what can you do to win their business? Sure you can show them the virtual tour, stats reports and social networking built right in. Offer them the online distribution engine and then show them your PanoRider. Even with online distribution, over 70% of home buyers claim the yard sign in front of the house is still an extremely valuable source of information and the PanoRider is a VERY effective yard sign. Prospective buyers who pass by a sign need a reason to react to and remember the listing. By adding a PanoRider to the sign, you have instantly given that person an easy, non-confrontational way to access information online. When they are ready to contact the listing agent, the phone number, website and email are right in the tour window. So be sure to offer your clients your PanoRider every time they place an order. You will be surprised how many agents want these great marketing tools. But it is up to you to tell them about it! If you don’t have a PanoRider, order one right now and keep it in your car. Then you can pull it out at the photo shoot and show the agent in person. You WILL sell many more of them if you do this every time. It’s easy money and you hardly have to do anything other than show them the product and collect the money!